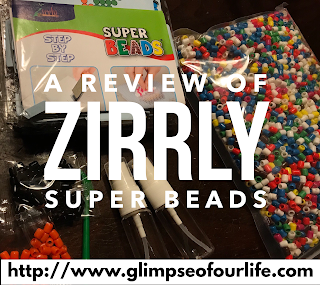 The following is a review of the Super Beads Mega Pack from Zirrly with the TOS Homeschool Review Crew. We received a Super Beads Mega Pack which included a bag filled with over 4500 Super Beads, as well as enough clear trays and design pattern cards for four people to work on the same design (or a different one) simultaneously, two tiny spray bottles, a green plastic design tools, and instructions. Additional instructions were also provided by email. Small bags of black and orange beads were inside the large bag; the other colors of beads were all packaged together. Four color coded design cards for each of the four designs pictured below were included, sixteen cards total. 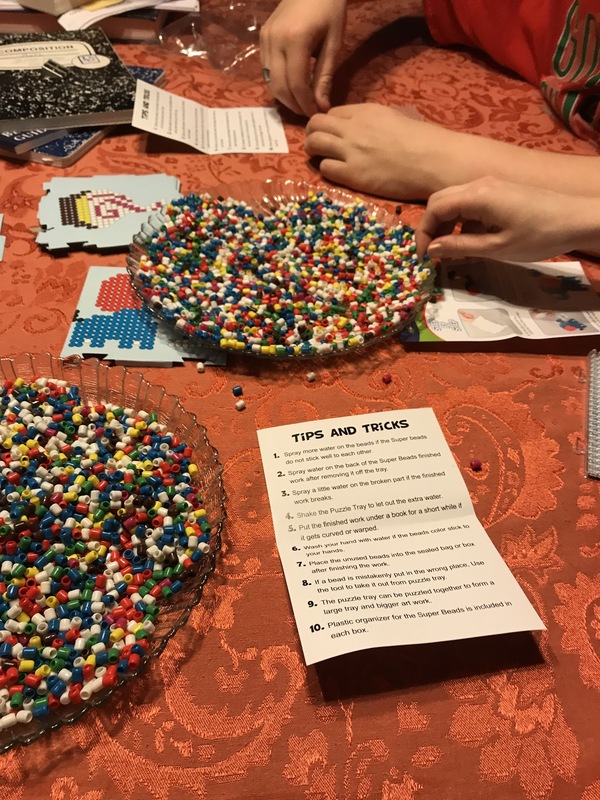 Sorting the colors by picking them up individually could be a helpful task for someone needing to work on improving their pincer grasp or sorting skills. 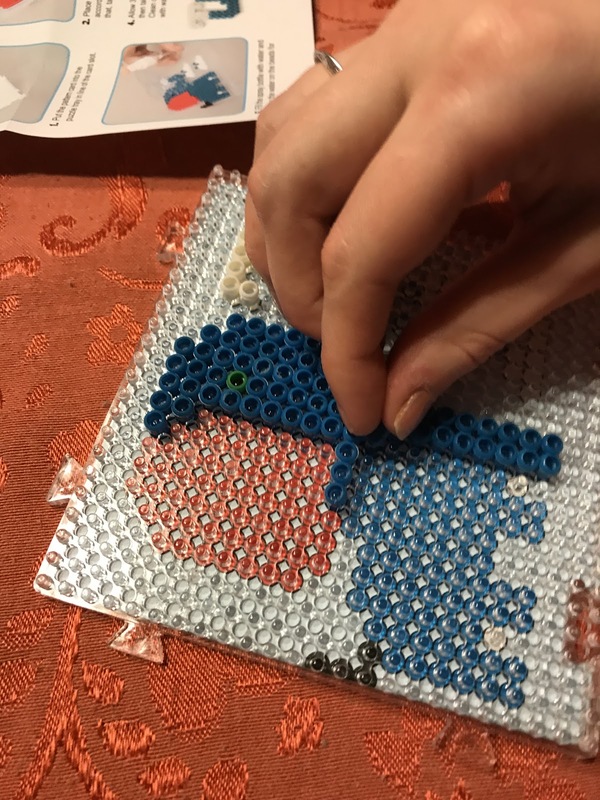 Placing the beads onto the tray also requires a precise pinch. When we first opened the bag, my son compared the strong scent to school glue. We emptied the bags onto two large plates. The smell remained but was less strong after the beads had been open for a while. 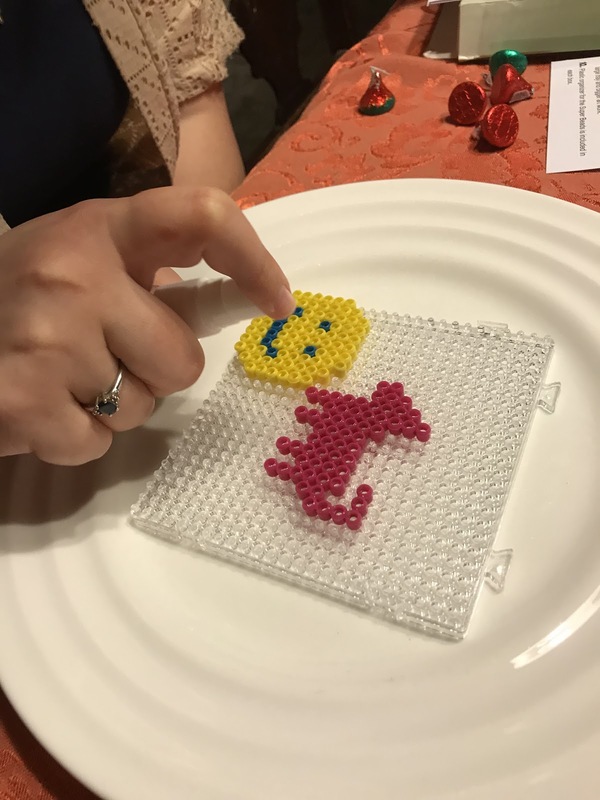 The instructions directed us to place the beads with the raised line pointing up. Without reading that, I may not have noticed that thin line. We initially followed the designs on the included cardboard pattern boards which were folded and pushed under the plastic bead boards. We had fun creating our own designs. 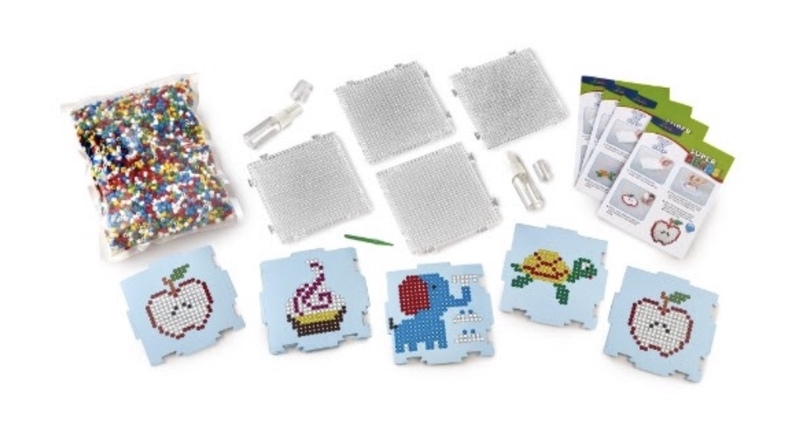 We noticed two 3-D jewelry designs (crown and bracelet) in the website’s pictures for this kit. 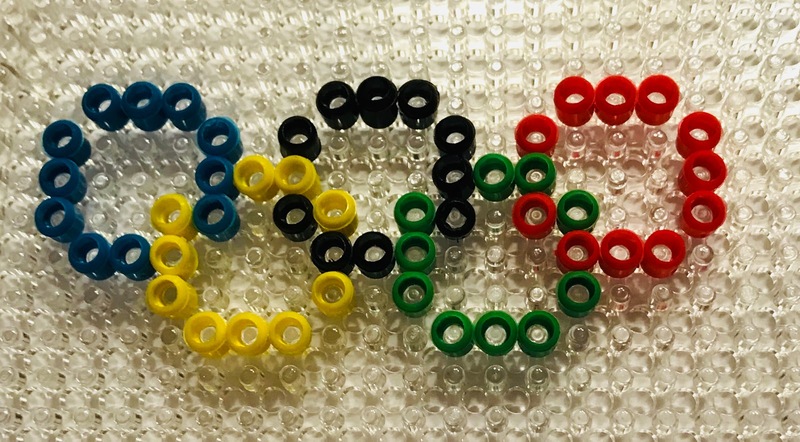 When we first received the package, we were also watching the Olympics, so I was inspired to copy the Olympic Rings. Making circles with the board was not easy, and overlapping the colors correctly was a challenge. We even tried turning the board diagonally when making heart shapes, but we found that using it the way it is designed worked best. If not yet sprayed with water to adhere together, such as the circles which were not really connected, the beads can be removed from the board and used again and again. 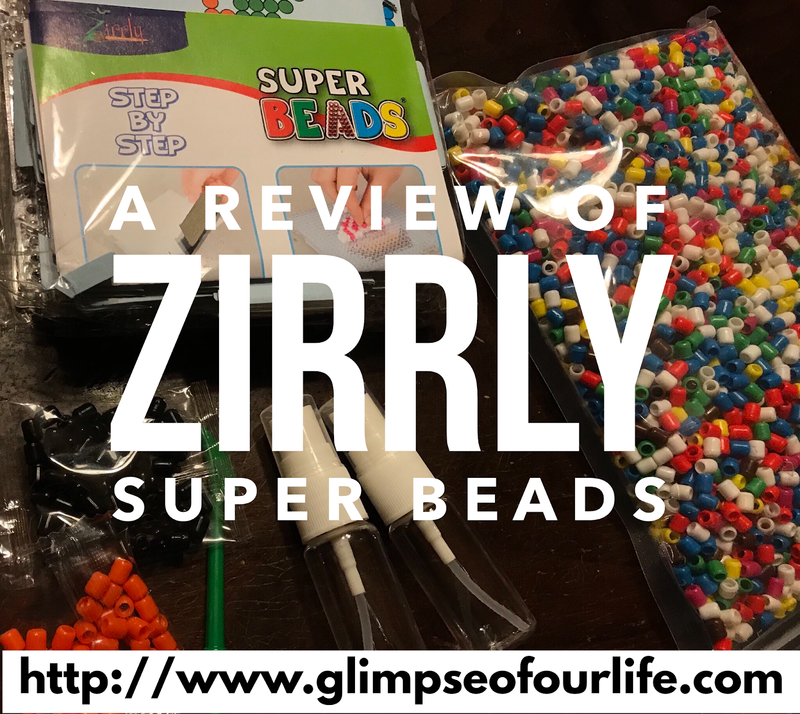 These Super Beads would be useful for addressing multiple visual and visual motor skills. Following the included design cards could be made more challenging by completing the design with the card visible but not directly beneath the clear design board. Eye hand coordination and fine motor coordination were required for bead placement. Minimal strength was required to spray the water bottle and to remove/pull the dried designs from the boards. When we completed each design we positioned the boards over a plate before spraying them with water. The tiny water bottles held enough water to spray several projects before refilling was needed. We left the completed designs on a scrap of cardboard to dry overnight. These Super Beads are a fabulous safer alternative to similar ones which my daughters used years ago which fused together by ironing. We all had fun! 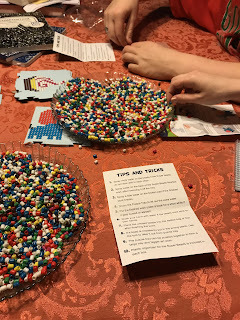 I recommend them for anyone cognitively aware not to put the tiny beads in their mouth. Their 3-D kits are recommended for ages 10+. I like your Olympic Rings. Good idea. 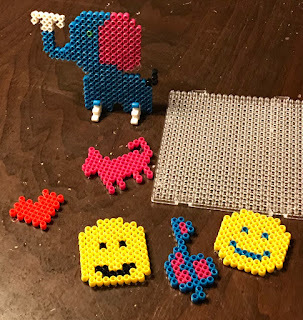 My kids made some squares with the left over beads from our car kit. Thank you! This was a fun review.